I will take on this world, one monkey at a time. I am THE biggest Roseanne Barr fan out there. I have been watching her sitcom since I was a kid and as an adult on a continuous basis. It is on everyday on different networks, you can’t miss it even if you tried. Even if I do miss it, I have the whole collection on DVD. I absolutely love the comical wittiness of this sitcom. I love Roseanne’s comedy, I think it is not only genius but quite fascinating. How can someone be so on point and so quick, even without a team of writers? There is no other way to put it, she’s hilarious. Even though “Roseanne” ended, she went on to bigger and better things. She had her own talk show for a while, had a couple different reality series, and currently is a judge on “Last Comic Standing”. 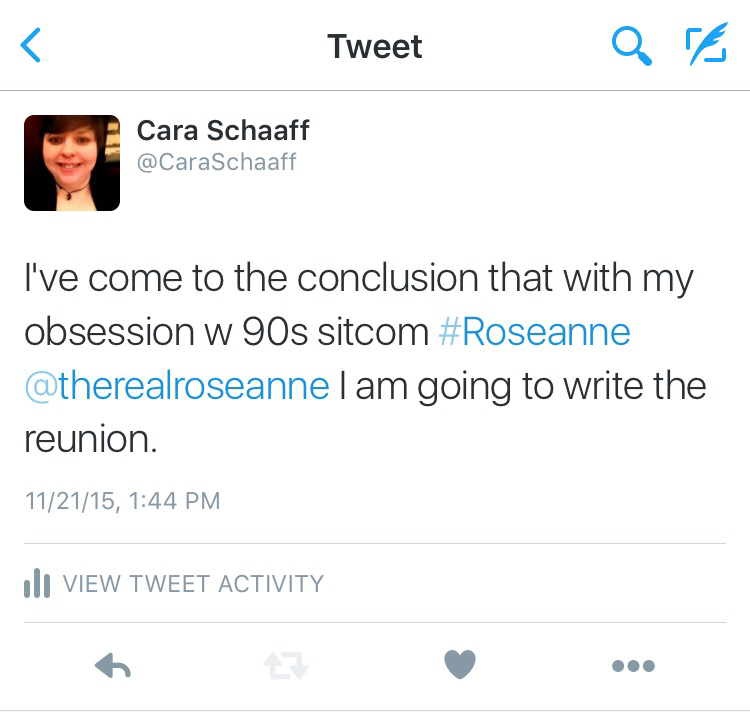 But would there ever be a legit written “Roseanne” reunion? I’m not going to sit around and wait to see if someone is going to write one up. I took it upon myself to write one. It is worth a shot to see if Roseanne sees my post and if she would respond. I am working out whether to do just a TV movie type style reunion like what “Growing Pains” did or steal the idea from “Full House” and come up with a 13 episode mini-series sitcom revival. Either way I’m going to have two versions of my script. Version one would be with Dan Conner (John Goodman) and version two would be without him. The reason why I am contemplating two versions is because in the final episode, Roseanne admits that he passed away from the heart attack he had at the end of season 8. She also claimed that Jackie (Laurie Metcalf) is really a lesbian and her daughters switched husbands. I either would take ALL of that in consideration and that would be version two, or leave it with the family scenario that we knew and loved and continue with the story that way. Hopefully after Thanksgiving, I can have my first draft finished. I will keep posted of my progress and will post the first draft up here for those who would want to read it. I hope Roseanne would consider reading it as well, but we all know that could very well be a long shot.